My colleagues Pravin Satpute and Anish Patil have been working for sometime on a cool tool called the Indic Typing Booster. The premise for this tool is to aid users new to typing in Indian languages. Using a normal US English keyboard (i.e. the widely available generic keyboard around here) users begin typing a word in a keyboard sequence of their choice and after a couple of key presses the typing booster prompts the user with a series of words that match the initially typed in key sequences. For instance, if the user wanted to type the word ‘कोमल’ (pronounced as: komal) in a phonetic keyboard sequence that maps क to k and ो to o, they could start by pressing ‘k’ and ‘o’ and lo and behold (no not Baba Yaga, but) a drop down menu opens up with possible words starting with ‘ को’ . From this list the user may then choose one to complete the word they had intended to type. List of words from a backend database feeds this list. Each language gets a database of its own, compiled from available text in that language. Users can add new words to the list as well. Besides erasing the need for looking for appropriate keys while maneuvering through the inherent complications of Indic text, the typing booster could evolve into the much needed solution for Indic typing on tablets and smartphones. After Marathi, Gujarati and Hindi, the Indic Typing Booster is now available for Bengali (yay!). The Bengali database is by far the biggest store so far, thanks to the hunspell list that was created through an earlier effort of Ankur. Pravin announces the new release here. 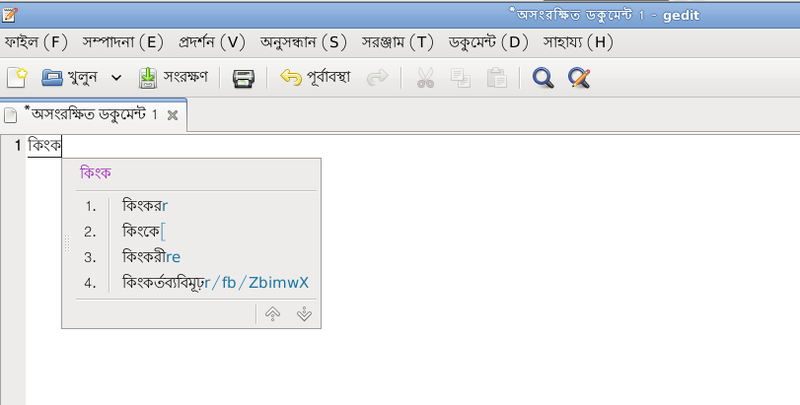 So to write কিংকর্ত্যবিমূঢ়, I could either type r/f/ZbimwX or just press 4 to complete it. Do please give the Indic Typing Booster a go and if you’d like to contribute then head over to the mailing list – indic-typing-booster-devel AT lists.fedorahosted.org or IRC channel – #typing-booster channel (FreeNode). This entry was posted in planetarium, Work & Technology and tagged bengali, bengali-l10n, fedora, fedora-l10n, indic-typing, l10n, planetarium on February 3, 2012 by runa. Looks like the problem related to the loss of translation credits in Fedora translations via Transifex.net has been resolved (as announced by diegobz). The translators’ names are now kept/written in the PO files headers. It might take a while (hours) for all resources to be affected. That was total yayness! from the Transifex team. Thank you! This entry was posted in planetarium, Work & Technology and tagged fedora-l10n, planetarium, transifex on May 26, 2011 by runa. For quite some time now, much discussion has happened about how the commits made to the Fedora packages through http://fedora.transifex.net does not preserve (among other things) translation credits. # Copyright (C) YEAR Red Hat, Inc.
# FIRST AUTHOR , YEAR. # Bangla INDIA translation of Anaconda. # Copyright (C) 2003, 2004, Red Hat, Inc.
# This file is distributed under the same license as the anaconda package. # Deepayan Sarkar , 2003. # Jamil Ahmed , 2003. # Progga , 2003, 2004. # Runa Bhattacharjee , 2004, 2005, 2006, 2007, 2008, 2009, 2010, 2011. # Runa Bhattacharjee , 2007. # Runa Bhattacharjee , 2008, 2009, 2011. All this while, none of us worked on Fedora 15 modules waiting for a resolution. A query to Fedora Legal is also waiting to be answered. After some discussions to review the current status of things, it was decided to stop translation work for Bengali-India for all Fedora modules until this situation is rectified in some way or the legal status of things is established with clarity. We have earlier been victims of credit related violations, and feel very strongly about it and would not like to endorse similar violations in any way. This has been filed as a ticket and is being worked upon by the Transifex team. Meanwhile, I am trying to keep a record of all the past credits (Bengali & Bengali-India translators) for all the Fedora modules translated for Bengali-India. It may take a little time to track them through the upstream repositories as a lot of modules have already gotten updated into their respective repositories with stripped .PO files (due to automatic merges/updates). The title for this post is derived from the now (in)famous twitter hashtag that came about after a tweet from a ‘well-known’ Indian blogger. This entry was posted in planetarium, Work & Technology and tagged bengali-l10n, fedora, fedora-l10n, planetarium on May 12, 2011 by runa. A few days ago, Dipankarda forwarded a request from a friend who was trying to figure out why certain fonts looked garbled on Fedora 14. In the process, we found that there were a couple of other keyboards for Bengali that could be added from iBus Preferences – ‘India-Bengali’ and ‘Bangladesh’. With a little tinkering around with Parag Nemade, it turned out to be an enhancement, which allows keyboards from xkbmaps to be integrated with iBus. The ‘India-Bengali’ keymap is the default/first layout in the /usr/share/X11/xkb/symbols/in file, while ‘Bangladesh’ keyboard is being generated from the /usr/share/X11/xkb/symbols/bd file. The first is a version of Inscript, while the latter seems to be based upon the Bijoy layout. However, there was one more layout for Bengali (ben_probhat) in the same file (/usr/share/X11/xkb/symbols/in ) which does not get added to the list of available keyboards. Could be a bug or a feature. To get these keyboards, its necessary to have the xkeyboard-config package installed as well. However, both of them may need to be reviewed. A more detailed version of things are available in Fujiwara’s blog post. This entry was posted in planetarium, Work & Technology and tagged bengali-l10n, fedora-l10n, planetarium on April 7, 2011 by runa. The other day I was playing around my Fedora 12 box to check some widget alignments and came across this interesting ‘bug’ related to the updation of the default directories in the user’s home. The directories ‘Desktop’, ‘Downloads’, ‘Templates’, ‘Public’, ‘Documents’, ‘Music’ and ‘Pictures’ are automatically present in the user’s home directory and these names can be translated in the xdg-user-dirs module. 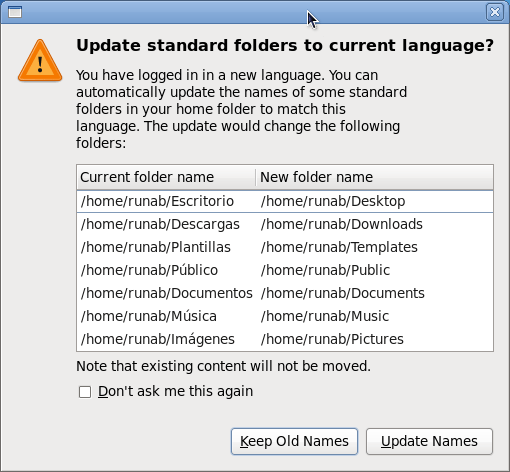 If the xdg-user-dirs-gtk module is installed, everytime a user logs into a new language interface from the gdm a dialog is presented prompting the user if she would like to rename these directories to the translated version. If she chooses to rename, then after logging in she would get these folders in the language she chose for the current session. Next time, when the same or another user chooses a different language while logging into another session, the prompt reappears and the user can again choose to rename the folders into their choice of language for the session. Rinse repeat. The catch here is that the translation of these folders have to be present for this dialog prompt to be displayed. In the earlier example, if there were no translations of these folders in user2’s choice of language, the dialog prompt would not have been displayed. This would result in user2 being stuck with (in all probability) incomprehensible folder names from user1’s session. The solution here is to revert back to the more conventionally accepted standard English names. The process of reverting involves, logging out from the session and logging into the English session, choose to rename the folders into English from the displayed dialog prompt and then logging back again into a session with the preferred choice of language. A probable solution to avoid this situation, is perhaps to display the dialog prompt for languages that do not have translations, with an option to rename them back to English. The other probable solution can be, to automatically rename them to English if there are no translations. The latter is the standard procedure for untranslated portions of UI messages. This is particularly important for languages that are written in non-latin scripts like the CJKI languages. Since the folders are actually moved, writing their names would become difficult from the console. On the other hand, if they choose to not translate then renaming them back to English would require an user to go through the hoops mentioned earlier. Since blog is not a bug, so one exists here (would have helped around if I had the skills). I hope I am not missing any existing solutions that are already present for this issue. Thoughts? This entry was posted in Work & Technology and tagged fedora-l10n, gnome-l10n, l10n, planetarium on March 18, 2010 by runa. Its that time of the year again when frantic efforts are underway for yet another Fedora release. Version 12, code named Constantine. Due to a turn of events, this time I got to be part of quite a few intricate processes – involving schedules, process changes and some amount of coordination. All for the Fedora Localization Project of course. As per the Release Schedule, the translation deadline is today – 10th September 2009. However, this time the FLSCo and FLP have been coordinating with Fedora Engineering to help us review the translations directly on the User Interface, by building test packages before the final freeze. Thankfully, FESCo gave us a nod on this and probably right after the translation deadline ends we would be ready to start talking to the package maintainers to get started on the package builds. Although working on each of these challenges have been mind-numbing at times and mostly late at night after long hours at the day-job, its been immensely satisfying and fun. Probably, I got to experience a very microscopic fraction of the many complications that are very much part of an OS release and I can only try hard to imagine the entirety of the challenges faced and wrestled to the ground each day by people like John Poelstra. There are lots of people all over the world working very hard and for them Fedora is very personal. This entry was posted in Work & Technology and tagged fedora, fedora-l10n on September 10, 2009 by runa. My views on why overt channel admins (the pronounced green medals, not the access lists) on irc channels in some open-source projects creates unwanted hierarchical levels. Mozilla 3.0.2 translation sprint. Am waiting for a few bug responses at the moment, but hopefully that should not stop the inclusion of bn-IN this time. But then let me talk about something thats really much more important. The other day Ani showed me the search feature on the KDE Translation Project website, that allows searching of a term/string in translated content. The setup in this case gets the content from a selected directory of the svn, runs a query for the search string and presents the output results (string and its translated version) with direct link to the source documents. A database is also involved somewhere in between the process. The project is a part of Fedora already and Kushal has packaged it. This entry was posted in Work & Technology and tagged fedora-l10n, gnome-l10n, kde-l10n, l10n, l10n-tools on August 16, 2008 by runa.